Lynn Hill and the late Alex Lowe. Where most people stop climbing, Lynn Hill digs in her tan little frame and keeps going, even if she can't reach the holds. Her sun-bleached hair whips around, rubberized rock shoes deform, and chalked-up hands leave legendary fingerprints on faces like France's "Critical Mass." For Hill, rock climbing means staying young. Whatever causes babies to climb out of cribs has become channeled into a huge industry led in part by the former gymnast from California who wasn't afraid to challenge a few rules. "I like being outside. I like the feeling of climbing, the movement, the fact that you use your whole body and you decide how you want to do it, instead of gymnastics, where you have a coach and have to do a specific routine in a uniform way. I like the freedom of climbing, the freedom of expression," Hill said. The 36-year-old was in Lander, Wyo., over the weekend as one of the featured guests at the fourth annual International Climbers' Festival. Speaking to a young crowd of high-altitude generations Xers — sandals, goatees, carabiners hanging off their belts — she test-marketed a video of herself as a look at the past and a hint to the future. Hill became famous during her competitive career, 1986-93, that took her around the world, racking up more than 30 international victories. The use of indoor climbing walls made it not only better for audiences, but paved the way for climbing gyms to pop up in places where there aren't any mountains. The events could also be used besides regular cliff climbing to find out who was the best. For many years, it was Lynn Hill. "People are finally discovering that it's a cool sport. I've known it for some time. It's just gone over the heads of a lot of people. Society has its traditional sports, football heroes and that sort of thing, and it's so easy to fall into that sort of pattern. There's a lot out there that people haven't been exposed to," she said. She didn't just win, she climbed so far away from the competition they couldn't reach her even after she slipped. In 1991, Hill had to sit out after a fall to the ground dislocated her elbow. With a three-month break in the season, she still ranked No. 1. Part of her success came from high school gymnastics. It was not only the strength and the flexibility she had developed but the "idea of learning and refining a trick, performing it and going for it," Hill said. As part of the next stage of her career, Hill produced and directed a video about one of her biggest challenges, free climbing The Nose on Yosemite's El Capitan, a beautiful assemblage that doesn't like to be scaled without the aid of permanent bolts drilled into its surface. Instead, Hill relied on temporary protection placed in cracks and grooves. 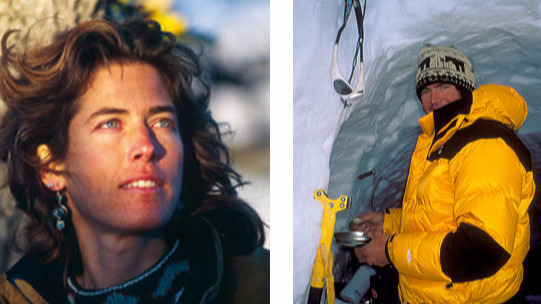 When Hill wasn't worried about filmmaking, she was busy making mountaineering history. She was the first — man or woman — to free climb The Nose in 1993. What added drama to the video was doing all three routes again the following year but in less than 24 hours. Gymnastics skills came in especially handy on the hard routes. "I went to the sections of the route that were the most difficult, and I practiced. Then I went down to the ground and did the whole series. That was the whole challenge, to put together a routine," Hill said. No one has since duplicated her perfect 10 performance of struggling up more than 3,000 vertical feet. It seemed a fitting thing to do after her retirement from competition. Helping her, oddly, was her small stature, because along with that came small hands. It was one of the few places in the world where her little grasping digits actually helped. "Most of the time being small is not an advantage, and there it was," Hill said. "It's true no matter what your body size you can usually find a way up it, but there are certain exceptional climbs in the world where if you're small you can't do it. If you're tall you can't do it. It's mostly discriminatory on the small side." Fear comes on different levels: fear of failure, climbing the super steeps and of falling. "When you look down and you see that you're going to fall into space or maybe hit something on the way down if it's not so steep, then you go into sort of that fight or flight mode, a kind of fear state," Hill said. "It's mostly your body preparing for action. You have to make sure you do the best you can to get out of the situation. It's a pretty intense feeling." But Hill doesn't view herself as a risk-taker compared to other mountaineers — rather, a "very cautious climber" who takes safety seriously, not some gravity-defying nut with a death wish. Facing tough climbs, pushing the limits of rating scales that differ from country to country although the rock remains the same, wasn't the hardest thing Hill has done. It was, perhaps, moving to the South of France by herself. "There was a draw for me. The climbing was good, and I wanted to learn the language. I was fascinated by that whole environment of not just the climbing but the lifestyle," Hill said. That lifestyle included taking a "nice break in the middle of the day," and enjoying other things — food, wine, cheese. Most importantly, it was being part of a culture so rooted in the mountaineering world. Even the schools have climbing walls. "It's like their version of baseball," she said. After living there from 1991 to last October, Hill decided she could make a better contribution to society in her own country by basing herself in Oregon. Besides, her stone house wasn't agreeing with her. "It was humid, and there was a problem with the septic system. It was more trouble than it was worth, so I just decided it was easier to have a house that was well-engineered in America," she said. Hill has a kind of magnetism that draws her to not only the world's best climbs, but it seems to pull her through life toward things she had never expected. And it all seems to make sense, a kind of controlled accident. For her the spotlight seems to burn hot in the middle, surrounded by darkness on the fringes where the small circle of climbers meets. Hill moves in between without stopping in the middle, a far-flung adventurer who goes to isolated places of the world, then returns to a room full of people. A pendulum that swings from Africa to Lander. A kind of life Hill admits she adapted to slowly. Being a pioneer seemed to fit her personality. She's one who doesn't worship individuals. Rather, she takes bits and pieces and positive qualities from different people. But she didn't have much choice either, the downside of mapping out new routes. "I enjoyed the sport and, in fact, it was a privilege to be there at a time when there was so much new stuff to be discovered. And that's what I like, discovering something new. Doing first ascents was a perfect example of that," Hill said, mentioning her specialty, freestyle climbing. At the festival, Hill talked about a recent trip to climb the big walls in Kyrgyzstan. One of her partners was Alex Lowe, considered by many to be the best alpinist in the world, who also spoke at the event. It's a place where air traffic control towers are abandoned and the water is dangerous, but the people are friendly. It was also a place where the differences in personalities of the climbers were apparent. Lowe talked about his adventures around the world, because, unlike Hill, he takes on the whole mountain, not just rock — climbing Everest twice; getting stuck in a snow cave in the Himalayas while another American team died in an avalanche below; setting numerous climbing speed records; and taking a sailboat around Cape Horn, where the waves were higher than the mast even though it was Lowe's first time sailing on his way to Antarctica to climb icebergs. On the Kyrgyzstan trip, Lowe and another climber took off on an impulse rock climb. Scaling the face with headlamps as darkness fell, it meant spending the night on the summit with little gear and only running shoes to get them down. They weathered the cold, rather than falling blindly into a crevasse. And that's where Hill said she and Lowe take different routes — one who seems to thrive on danger, and one who takes it in moderation. But they do have an understanding. "It is exciting. I understand the rush. It's almost like a drug the way he's pursuing it. I know that he has so much energy he needs to get out and do things. It’s such a great setting to be in the mountains." To her, the trip alone was enough just to climb virgin rock. In the broad world of rock climbing, she's no specialist when it comes to kinds of rock. "I don't like to do things that are inherently dangerous. In a mountain setting, you could have a storm and a lot of problems. The Kyrgyzstan trip that I took was the most out there that I've been. If we fell or something went wrong, we wouldn’t have support. It's not like you can call 911 when you’re up there on the mountain." Lowe laughed when asked what he hasn't done, citing a list of adventures for rock, dirt and ice. While he was near the South Pole, he had to deal with such minor problems as stepping into an inflatable dinghy with crampons. And he has a new hobby: climbing giant icicles. Living on a constant flow of adrenaline while scraping together enough cash for trips from film deals, he's not the type of guy to take on life passively. And neither is Hill. What the two climbers seem to have in common is seeing the world as a playground with unlimited thrills, only the rides are different. And summitting, after all, is merely a bonus. As for the future, Hill said it's back to childhood. Besides filmmaking and advertising for various sponsors, she has ideas for newfangled jungle gyms for "kids of all ages," she joked. "Climbing is one of those very innate things that we all do as babies and kids. You can see that when kids climb around on things, they just love it. It's a natural thing," Hill said. "Then as they grow up they conform to society and certain kinds of behaviors. Climbing is not necessarily part of that. That's why a lot of the climbers tend to be very childlike and non-conformists to society's rules and codes of behavior." When Hill was growing up, there were no climbing gyms. All she had was desire and a few buildings, but "it's horrible for your skin and it’s not much fun anyway," she said. As a member of The North Face Climbing Team, Hill has a full schedule until Christmas that includes trips to Idaho, Canada and Morocco to attend trade shows, photo shoots and more filmmaking. For the California girl who refused to grow up, life is good yet simple from the cradle to the grave. "I know there's risk in climbing. There's risk driving a car. I choose to drive a car. I choose to climb. That's my life, and if I die doing it, well, then that's the way it goes." Postscript: Alex Lowe died in an avalanche on Shishapangma, Tibet, in 1999. The Alex Lowe Charitable Foundation was created in his honor. The photo was taken by Conrad Anker in 1996.